In the year 3057, the world is constantly at war. There is no peace. Warriors are strapped into giant, robotic suits of armor battling for supremacy. You are one of those warriors. 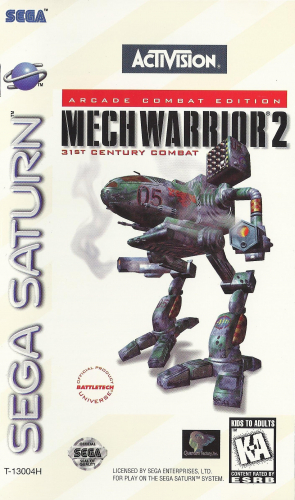 Battle in 48 missions including 16 created specifically for the Saturn. The controls have been simplified to allow for faster action. An improved AI provides for more enemies in each mission; thus, increasing the level of mayhem. As you work your way through a mission, you may discover power-ups that grant stealth, invincibility, and rate of fire increases. In MECHWARRIOR 2, the only lasting peace is death.